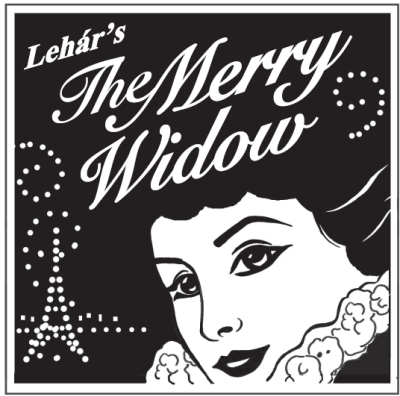 The Merry Widow is set in Paris in about 1900. Act I - The Petrovenian Embassy. At a ball in honor of the King of Petrovenia’s birthday – at which a number of Petrovenian ladies are flirting with a number of Frenchmen – Baron Zeta, the Ambassador, ponders the problem of how to save his country from bankruptcy. He is anxiously awaiting the arrival of Anna Glavari, the widow of a Petrovenian banker who has left her 20 million francs. This news makes the Frenchmen eager to meet her, which in turn makes Zeta and his councillors very worried: If the Widow marries a Frenchman, her millions will be lost to the Fatherland. Zeta has selected the Petrovenian Count Danilo Danilovitsch as the ideal bridegroom, but Danilo has not yet appeared at the ball. Zeta orders his assistant, Njegus, to locate Danilo. Meanwhile, the Parisian Camille de Rosillon is wooing Zeta’s wife Valencienne. Camille has just written on her fan what she will not allow him to say: “I love you.” She loves Camille, but considers her marriage sacred. They leave as Zeta arrives with Njegus, who has found Danilo carousing at Maxim’s. Zeta is infuriated to learn that Danilo has refused to come. The Widow now sweeps into the ballroom and is surrounded by eager Frenchmen. She reflects that she might be loved for her millions rather than for herself. Nonetheless, she invites everyone to come to her house the next night. Valencienne introduces Camille to her, whispering to Camille that he must end their affair and marry the Widow. But Zeta pushes through the crowd of suitors and escorts Anna into the ballroom. Danilo arrives, singing the praises of the grisettes at Maxim’s. He is a little the worse for champagne, so he decides to have a nap. Anna appears and is surprised to see Danilo. Years ago, he had wanted to marry Anna, but his uncle would have disinherited him. She bitterly tells him that her millions would now make up for her plebeian blood. Stung, Danilo tells her that she will never again hear him say, “I love you.” He leaves, and she privately vows to make him say it. Meanwhile, Valencienne continues to urge Camille to marry the Widow, but he refuses. At the same time, Zeta urges Danilo to marry the Widow, but he refuses. He does, however, promise to keep off all foreign suitors. A “ladies’ choice” dance is announced, and despite the pleas of the Frenchmen, Anna chooses Danilo. He refuses, instead offering to “sell” the dance for 10,000 francs, thus discouraging the Frenchmen. Camille is about to offer the money, but the jealous Valencienne stops him. Having driven off all the suitors, Danilo claims his dance, but this time Anna refuses – until he takes her in his arms. Act II - The Widow’s Garden, the next evening. Anna leads her guests in a Petrovenian ballad about the forest nymph Vilia. Valencienne accidentally leaves her fan on a chair. Anna tells Zeta that she has arranged a surprise for Danilo: she has re-created Maxim’s in her ballroom. Njegus brings Zeta a telegram from the Petrovenian ministry demanding an immediate answer regarding the 20 million francs. Danilo continues to refuse to marry the Widow. Zeta warns him that Camille is in love with the Widow, and Danilo becomes jealous. He then comes across Valencienne’s fan, which has Camille’s “I love you” written on it. The ladies he asks all deny that it’s theirs. When he shows it to the men, they conclude that some woman must have been unfaithful. Anna enters and plucks the fan out of Danilo’s hand. She reads the inscription on it, but he denies that he wrote it and insists that he does not love her. She tells him that she is inclined to marry again. He demands to know to whom, but she refuses to say. He declares that he will dance at her wedding. She suggests that they dance together for the last time, and they waltz off. Valencienne is frantically looking for her fan. She finds it, and Camille asks to have it as a keepsake. But she writes on it, “To my husband, from his faithful wife.” She again insists that he marry the Widow. He begs her to go with him into the pavilion so they can share one last kiss. She finally agrees. Njegus arrives just in time to see them go in. He tries to keep Zeta from looking, but Zeta peeks in and can see Camille with a lady. Zeta is delighted, as he can now take Camille out of the running for the Widow’s hand. Njegus desperately seeks the Widow’s help. Zeta peeks again and is stunned to see Valencienne. But before he can denounce her, she escapes through the back, and Anna takes her place. All are amazed when Anna and Camille come out of the pavilion together, and Anna announces their engagement. Danilo bitterly declares that fidelity in marriage is passé, but Anna counters that her marriage will be in the fancy-free “Parisian style.” Danilo, furious, runs off to find comfort with the grisettes at Maxim’s. Anna realizes that he still loves her. Act III - The Widow’s Ballroom. Anna has transformed her ballroom into Maxim’s, complete with grisettes – including, to Zeta’s shock, Valencienne. Zeta receives another telegram from the King, threatening bankruptcy. Danilo promises to do his best to marry the Widow. He urges Anna not to marry Camille, for the sake of the Fatherland. He is delighted when she explains what really happened in the pavilion. He finally admits that he loves her, and asks her to marry him. She reveals that, under the terms of her late husband’s will, she will lose her entire fortune if she remarries. Danilo takes her into his arms. Zeta is thrilled that Anna will marry Danilo – but collapses when he learns that she will forfeit her entire fortune. He recovers when Anna explains that upon her remarriage the money will revert to Petrovenia. Bogdanovitch returns Valencienne’s fan, which he had found near the pavilion. Zeta now angrily realizes that it must have been Valencienne in the pavilion with Camille. Husband and wife are reconciled when Valencienne shows Zeta the message she wrote on the other side of the fan. Everyone celebrates.